Pointless row over J & K’s accession Time to focus on regional aspirations by Balraj Puri The controversy over J&K Chief Minister Omar Abdullah’s statement on the state’s accession to the Indian Union was revived over a month after it was made, as the BJP and some allied parties organised a bandh in Jammu in protest against it on November 8 when the Durbar — the government offices — moved to Jammu, the winter capital. The momentum of the protest has further been raised. The party is holding demonstrations at various places where effigies of the Chief Minister are burnt. Some national leaders of the BJP have joined these protests. The party proposes to raise the issue in Parliament and organize a bigger protest rally in Jammu, where its senior national leaders are expected to be present. The party has demanded an apology from the Chief Minister, who instead has reiterated his statement. On October 6, the Chief Minister in his 90-minute speech in the State Legislative Assembly had said, “Accession of the state to India has occurred under an agreement. We have not broken that agreement, but you have gradually demolished it and people are aggrieved and angry for your act.” He further drew a distinction between the accession of the state and that of other states which, unlike J&K, had merged. The statement was hailed in separatist circles. Syed Ali Shah Geelani said, “Omar’s stand is not only the vindication but also victory of the conglomerate’s (Hurriyat’s) stand.” On the contrary, the statement has shaken the pro-India elements. The BJP has made it a national issue. In fact, it is not so much an issue of views as of facts. The fact is that accession has no degrees. It is either accession or secession. The slogan raised by the Jan Sangh in 1953 for full accession and now by the BJP had no meaning. The controversy over full and limited accession had made the fact of accession a matter of controversy. Similarly, it is simply not true that the accession of J&K to the Indian Union was under different conditions than those prevailing in other states. All princely states acceded to the Indian Union on the same terms and all rulers signed the same instrument of accession. There was no separate agreement with the J&K state as contended by the Chief Minister, unless he meant the promise of a plebiscite. But that was subject to many conditions which are a subject of dispute between India and Pakistan. The National Conference no longer insists on it. What other agreement does Omar refer to under which the accession was made? Originally the Constitution of India had divided the country into three parts: (A) The erstwhile provinces in the British regime, (B) the princely states, and (C) the states directly ruled by the Centre. After some time, changes took place in the Constitution. Some states merged together as Patiala and some adjoining states called Pepsu. The institution of princes, too, was abolished in all states as it was done in Jammu and Kashmir. The others merged with the neighbouring states at the time of reorganisation on the basis of their linguistic affinity. Most of the states opted for a status equal to the part “A” states under popular pressure, mobilised by the Praja Mandals, counterparts of the Congress in the princely states. Thus, the provision for the “B” states in the Constitution was abolished. In the case of Jammu and Kashmir, no major changes took place till 1964 when the head of state continued to be called Sadar-i-Riyasat and the head of government as Prime Minister. In the post-Nehru period, major changes took place in the constitutional relations of the state with the Union against the popular sentiment in the valley when its most prominent leader, Sheikh Abdullah, was in jail. So far as Chief Minister Omar Abdullah’s distinction between accession and merger is concerned, there seems to be some confusion, as no state of the country has fully merged into the Union of India and every state has some amount of autonomy. In fact, in a federal country, no state is fully merged. There has been the demand in the states like Tamil Nadu, Punjab, West Bengal and those in the Northeast for more autonomy, and the case of Jammu & Kashmir is no different from these states. In the same states, the demand for autonomy took a more aggressive form. In Punjab, it was taken over by terrorists, who demanded secession while in Tamil Nadu the Indian flag and the Constitution were burnt in the early years of Independence. In the Northeast, a violent movement is still going on. Gradually, the Indian federal system was able to satisfy the aspirations of most of the states excepting the Northeast and J&K. The powers of the states expanded partly because opposition parties were elected to form the government in many states and partly because of a liberal interpretation of the Constitution by the Supreme Court. Earlier the Centre could dismiss any state government and impose Governor’s rule, who represented the President and worked under the direction of the Union Government. Now no elected state government can be dismissed arbitrarily by the Union government as long as it is working according to the provisions of the Constitution. In J&K, as long as the state government was run by a party different from that in power at the Centre — the National Conference in J & K and the Janata Party and the Congress at the Centre from 1975 to 1986 — the people of Kashmir enjoyed a greater degree of autonomy and there was no sense of alienation among them. However, now partly on account of regional tensions, internationalisation of the issue by Pakistan and partly due to the follies of the Central government, discontent was revived and continues to be there in the Kashmir valley. Basically, the National Conference wants more autonomy as agreed upon by Pandit Nehru and Sheikh Abdullah in 1952, which can be considered. 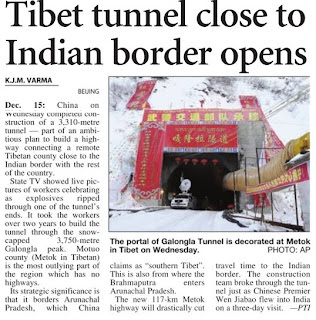 But the apprehensions of Jammu and Ladakh regions about it cannot be dismissed. The first step, therefore, should be to reconcile the aspirations of all the regions which the 1952 agreement had taken care of. For, this also included a provision for regional autonomy. It is within the jurisdiction of the state assembly to grant regional autonomy. It is the responsibility of the government and the political parties of the state to decide the exact form of regional autonomy. If regional aspirations are satisfied, it would be much easier to work out a consensus over the form of autonomy in the state or any status that the leaders of Kashmir aspire for. The writer is Director, Institute of Jammu and Kashmir Affairs, Jammu. onverting ceasefire into surrender GOC-in-C, Eastern Command, Lt Gen J.S. Aurora (left) oversees his Pakstani counterpart, Lt Gen A.A.K. Niazi, signing the historic Instrument of Surrender in Dacca. Standing behind, from the left, are Flag Officer Commanding-in-Chief Eastern Naval Command, Vice Admiral N. Krishnan, Air Officer Commanding-in-Chief Eastern Air Command, Air Marshal H.C. Dewan, GOC IV Corps, Lt Gen Sagat Singh and the author, then Maj Gen J.F.R. Jacob GOC-in-C, Eastern Command, Lt Gen J.S. Aurora (left) oversees his Pakstani counterpart, Lt Gen A.A.K. Niazi, signing the historic Instrument of Surrender in Dacca. Standing behind, from the left, are Flag Officer Commanding-in-Chief Eastern Naval Command, Vice Admiral N. Krishnan, Air Officer Commanding-in-Chief Eastern Air Command, Air Marshal H.C. Dewan, GOC IV Corps, Lt Gen Sagat Singh and the author, then Maj Gen J.F.R. 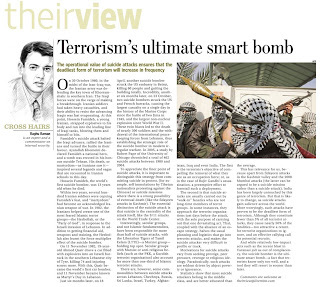 Jacob There has been much disinformation put out in India about the 1971 operations. My book — Surrender at Dacca — was published in 1997 and copies were given to Field Marshal Sam Manekshaw and Lt Gen J.S. Aurora in 1997. There were no rejoinders. The book has been translated into Chinese, Thai, Persian, Arabic, Bengali, Marathi and Hebrew and is taught in military institutions and some universities across the world. Following is an extract from the book Crossed Swords, authored by Shuja Nawaz, brother of a former Pakistani Army chief: "In the words of a later Pakistan's National Defence College study of the war, the Indians planned and executed their offensive against East Pakistan in a text book manner. It was a classic example of thorough planning, minute coordination, and bold execution.” Hamood-ur-Rehman Commission findings n Very critical of the role of Pakistani military and politicians. n Pakistani Army carried out senseless killings of intellectuals, professionals, industrialists and Bengali officers. n Pakistani generals surrendered prematurely. The military’s continued involvement in running the government was one reason for corruption and ineffectiveness of senior officers. n Corruption resulting from such involvement, lust for wine and women and greed for land and houses resulted in serior officers losing their professional competence and the will to fight. n Recommended Gen Yahya Khan, Pakistan’s then military ruler and 11 other generals, including Lt Gen A.A.K. Niazi, be tried publicly. The report recommended a string of courts-martial against top military officers. Pakistan’s commander in the east, Lt Gen A.A.K. Niazi, had sent a cease fire proposal that specified a withdrawal of the armed forces, para-military and ethnic minorities under the UN along with handing over of the government to this this international body. No war crime trials were to be held. 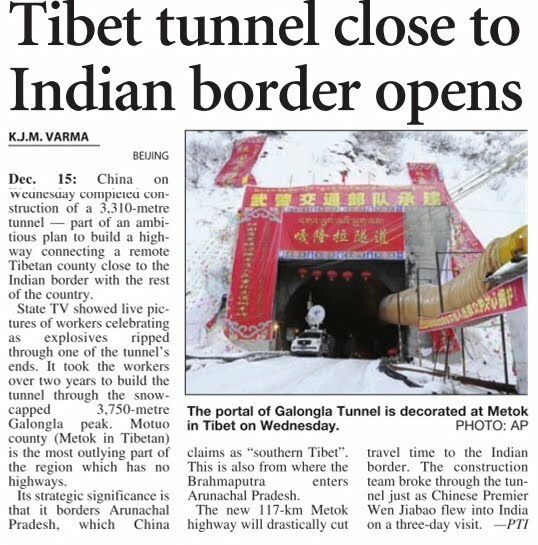 There was no mention at all of India in his proposals. The ceasefire proposals were rejected outright by Z.A. Bhutto in New York, where he was to attend a meeting of the UN Security Council. Bhutto tore up the resolution vowing to fight on. A ceasefire was announced by India on December 15. On the morning of December 16, Manekshaw asked me get a “surrender”. The UN Security Council was in session. I had sent a draft Instrument of Surrender to Manekshaw some days earlier, which the latter declined to confirm. I took this draft that I had earlier sent to Delhi with me to Dacca (now Dhaka). At Dacca I was met by representatives of the UN, Marc Henry and Kelly, who asked me to accompany them to take over the government. Fighting was still on in Dacca between the Mukti Bahini forces and the Pakistani Army. I thanked them but regretted their offer and proceeded in a Pakistan Army staff car accompanied by a Pakistani brigadier. A few hundred yards down the road the Mukti Bahini fired at the car. I was unhurt. They had wanted to kill the brigadier, but I persuaded the Mukti Bahini to let us proceed. I negotiated the surrender with Niazi at his headquarters. On the draft Instrument of Surrender that I had earlier sent to Delhi but still remained unconfirmed, in a span of about four hours, a ceasefire proposed under the auspices of the UN was converted into an unconditional public surrender of 93,000 troops. This was the only public surrender in the history of modern warfare. The German Field Marshal, Von Paulus surrendered at Stalingrad with 90,000 troops during the Second World War. Here, it is relevant to quote the Hamood-ur-Rehman Commission of Inquiry, that had investigated Pakistan's failure in 1971 (see box), questioning Lt Gen Niazi : "General Niazi, when you had 26,400 troops in Dacca and the Indians only a few thousand outside and you could have fought on for at least two more weeks, the UN was in session and had you fought on even for one more day, the Indians would have had to go back, why did you accept a shameful, unconditional public surrender and provide a guard of honour commanded by your ADC ?' (sic) Niazi replied : 'I was compelled to do so by General Jacob who blackmailed me into surrendering,…. etc., etc." This he has repeated in his book, Betrayal of East Pakistan. Suppose I had failed to convert Niazi's proposed cease fire under the auspices of the UN into an unconditional public surrender of 93,000 Pakistani soldiers, the UN would have ordered a withdrawal the next day and taken over the administration of East Pakistan. I did not fail. A new nation — Bangladesh — was born. And India became a regional super power. Due credit for the victory must go to our officers and men who fought so gallantly. About 1,400 were killed and 4,000 wounded. Let us not forget their sacrifice. The rifle and helmet placed at Amar Jawan Jyoti on Rajpath in New Delhi have been recovered from the battlefield at Jessore. These once belonged to an unknown soldier who played an incognito yet an indispensable part in history. Situated in south-western Bangladesh, Jessore was the first district to be liberated from Pakistan on December 7, 1971. Guilty in Adarsh scam not to be spared: Antony Tribune News Service New Delhi, December 15 Making the stance of the government clear, Defence Minister A K Antony today said any person found guilty in the Adarsh Housing Society scam in Mumbai would not be spared. Among those facing the probe are three retired chiefs of the forces and a number of IAS officers in Maharashtra who were involved in allowing the construction of the 31-storeyed housing society in Colaba on land that was in “possession” of the Army. Antony told reporters that “whoever is found guilty will be punished. Nobody will be spared.” He was at an aerospace seminar organised jointly by the Think-Tank Centre for Air Power Studies and the CII. “We want to maintain integrity. We will not ignore it,” Antony said. The Defence Minister said: “Whenever allegations are proved, we take strong action. No other agency takes this strong action. 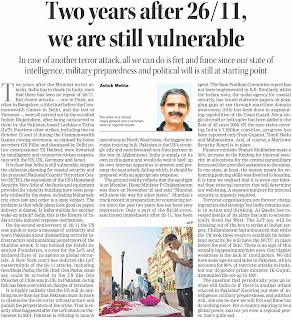 Only the armed forces have been taking strong action.” At present, he confirmed, inquiries were being held by the CBI and the Army to fix responsibility. “These investigations are going on. We will take whatever action is required.” The 100-metre-high building is within the security perimeter of the naval establishments in Colaba and the Navy had raised an alarm stating that the high-rise posed a grave security risk as all vital installations were easily visible from the tall building. A Defence Ministry probe had revealed that several serving and retired Army officers and Defence Estates officials had colluded with the private housing society to construct the building there. China & India not rivals, says Jiabao In Delhi, Chinese Premier pitches for trade Ashok Tuteja/TNS Wen JiabaoNew Delhi, December 15 Chinese Premier Wen Jiabao landed in New Delhi this afternoon to a red-carpet welcome, declaring that the world had enough space for India and China to prosper and pledging to promote ties between the two Asian giants, often dogged by mutual distrust and territorial disputes. Like British Prime Minister David Cameron, US President Barack Obama and French President Nicolas Sarkozy, the Chinese leader brought with him a huge delegation of top businessmen, clearly suggesting he would primarily focus on expanding economic partnership and contentious political issues might have to take a back seat. 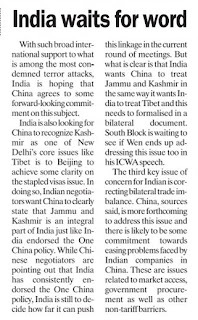 Officials from both sides have been cautious not to raise expectations from the visit in view of the sensitive nature of relationship. “One can’t really say anything with certainty about Sino-Indian relations or India-Pakistan relations… we have to tread cautiously,” an Indian official said on condition of anonymity. Late in the evening, Prime Minister Manmohan Singh hosted a private dinner in honour of the visiting leader at his residence. The 20-odd guests included on the Indian side senior ministers Pranab Mukherjee and S M Krishna, Leaders of the Opposition in the two Houses of Parliament Sushma Swaraj and Arun Jaitley, and a few senior officials. The Chinese Premier was accompanied by Foreign Minister Yang Jiechi and Chinese envoy to India Zhang Yan. The two leaders also had brief informal talks at which they are understood to have reviewed the state of bilateral ties and considered steps needed to be taken to cement the relationship. They will hold extensive talks on the entire gamut of bilateral ties and international developments tomorrow, followed by signing of agreements between the two countries. At these talks, the Indian PM is expected to flag off India’s concerns over some of the major issues like China issuing stapled visas to Indian nationals from Jammu and Kashmir, presence of Chinese troops in Pakistan-occupied Kashmir (PoK), nuclear cooperation between China and Pakistan and the growing trade imbalance between the two countries. Significantly, the Chinese leader will be visiting Pakistan after wrapping up his India visit. Manmohan Singh may also talk about India’s bid for a permanent seat on the UN Security Council in view of the fact that all other four permanent members of the UNSC have already endorsed India’s candidature for a seat on the high table. Shortly after his arrival in the Capital on a three-day visit, Wen addressed industry leaders of the two countries at a meeting organised by the Indian apex chambers of commerce. 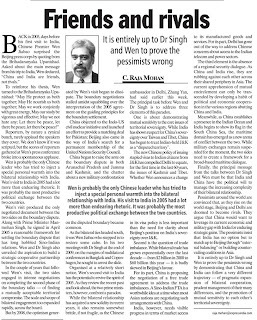 “China and India are partners for cooperation and not rivals in competition. There is enough space in the world for the development of both China and India and there are enough areas for us to cooperate,” he said, rejecting the Chinese ‘dragon’ and Indian ‘elephant’ theory being often propagated by the West. The Chinese leader also sought to address India's concerns over ever-expanding bilateral trade imbalance, seen at $ 24 billion this fiscal, and assured he was open to more imports and would try to expand the prospects for Indian exporters. “We'll offer more platforms for Indian products in China,” said Wen, who is accompanied by a 400-strong business delegation. “Also, by opening markets to each other, we will be the most dynamic economies and can support each other in economic development.” He said his visit would yield deals worth around $ 16 billion between the corporate sectors of the two countries. Some 50 MOUs were signed today, including a large one between the China Development Bank and Reliance Power. Chinese officials have said they would like to see a free trade agreement (FTA) between the two countries but New Delhi argues that there are too many concerns about subsidies in the Chinese market that could influence prices. 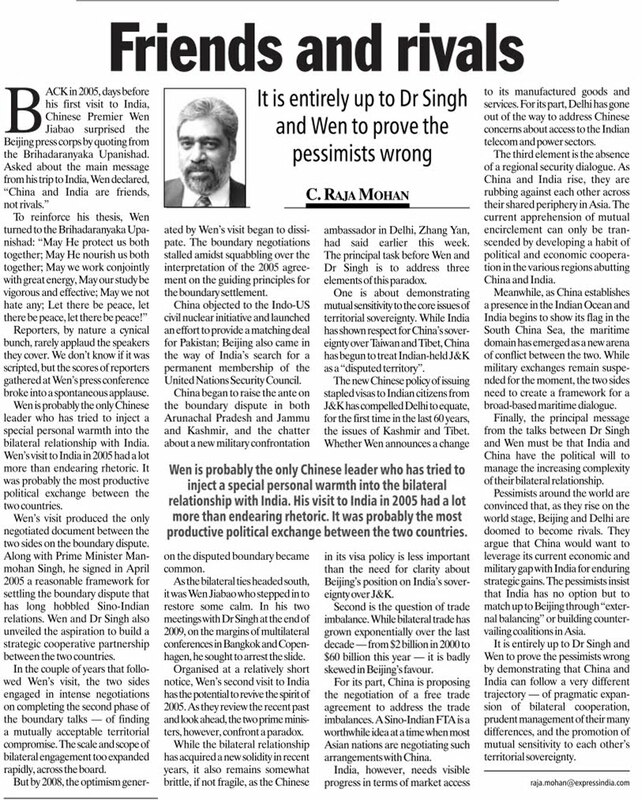 India is pitching for greater access for Indian goods in the Chinese market as well as greater Chinese investment, especially in the infrastructure sector, into India. U.S. Air Force blocks NYT and Guardian over WikiLeaks The U.S. Air Force has blocked employees from visiting media websites carrying leaked WikiLeaks documents, including the New York Times and the Guardian. Source : Reuters Wed, Dec 15, 2010 09:59:19 IST Views: 16 Comments: 0 Rate: 1 out of 5 2 out of 5 3 out of 5 4 out of 5 5 out of 5 0.0 / 0 votes THE U.S. Air Force has blocked employees from visiting media websites carrying leaked WikiLeaks documents, including the New York Times and the Guardian. Major Toni Tones, a spokeswoman at Air Force Space Command in Colorado, said it had blocked employees whose computers are connected to the Air Force network from accessing at least 25 websites that have posted WikiLeaks documents. The Air Force "routinely blocks Air Force network access to websites hosting inappropriate materials or malware (malicious software) and this includes any website that hosts classified materials and those that are released by WikiLeaks," she said. The U.S. government is seeking to minimize the damage from WikiLeak's release of 250,000 State Department cables through some media outlets and on its own website. The cables released last month, which reveal blunt, sometimes derisive depictions of foreign governments and leaders, have been an embarrassment for Washington. "It is unfortunate that the U.S. Air Force has chosen not to allow its personnel access to information that virtually everyone else in the world can access." New York Times spokesman Robert Christie said in a statement. A representative from the Guardian was not immediately available for comment. The Wall Street Journal first reported the news of the block. 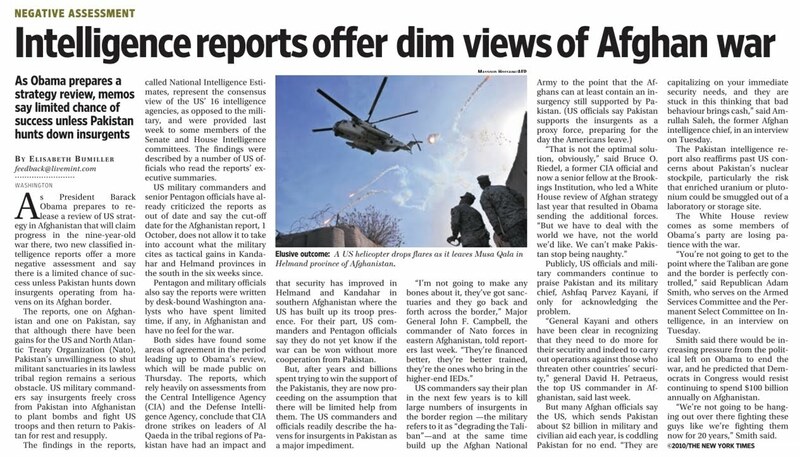 Past releases this year by WikiLeaks, which is a website that publishes leaked documents, contained sensitive information about the wars in Iraq and Afghanistan, which Washington said compromised national security and put people at risk. 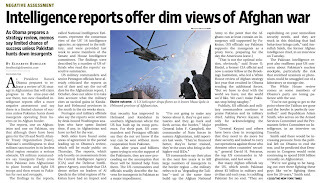 "It seems like a comical, clumsy attempt to deal with a real issue," Ken Doctor, an analyst with Outsell Research who covers the media, said of the Air Force move. "It is almost like something out of Dr. Strangelove." "Dr. Strangelove or How I Learned to Stop Worrying and Love the Bomb" is a 1964 satirical film about a U.S. Air Force general who ordered a nuclear attack on the Soviet Union. "It's really putting established publishers into the category of miscreants," said Emily Bell, director of the Tow Center for digital journalism at the Graduate School of Journalism at Columbia University. The Pentagon had already prohibited its employees from viewing WikiLeaks documents online, but it has not blocked access to websites that post leaked cables. Pentagon officials have instructed employees they "shouldn't access the WikiLeaks site because the information there is still considered classified," said Colonel David Lapan, a Pentagon spokesman. Adarsh scam: 'Guilty will not be spared', says Antony Defence Minister A K Antony had earlier last month recommended a Central Bureau of Investigation (CBI) probe to fix responsibility of the armed forces and defence estates officers in the Adarsh Housing Society scam in Mumbai. CJ: Vijay Singh Wed, Dec 15, 2010 17:14:00 IST Views: 8 Comments: 0 Rate: 1 out of 5 2 out of 5 3 out of 5 4 out of 5 5 out of 5 0.0 / 0 votes DEFENCE MINISTER A K Antony on Wednesday said the government and the armed forces will not spare any person, who is found guilty of wrongdoing in Mumbai''s Adarsh Housing Society scam. "Whoever is found guilty will be punished. Nobody will be spared. Whenever there are allegations and they are proved, we take strong action. 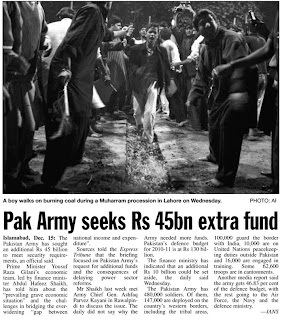 Whatever the allegation, the armed forces and the government is taking action. No other agency takes this strong action. 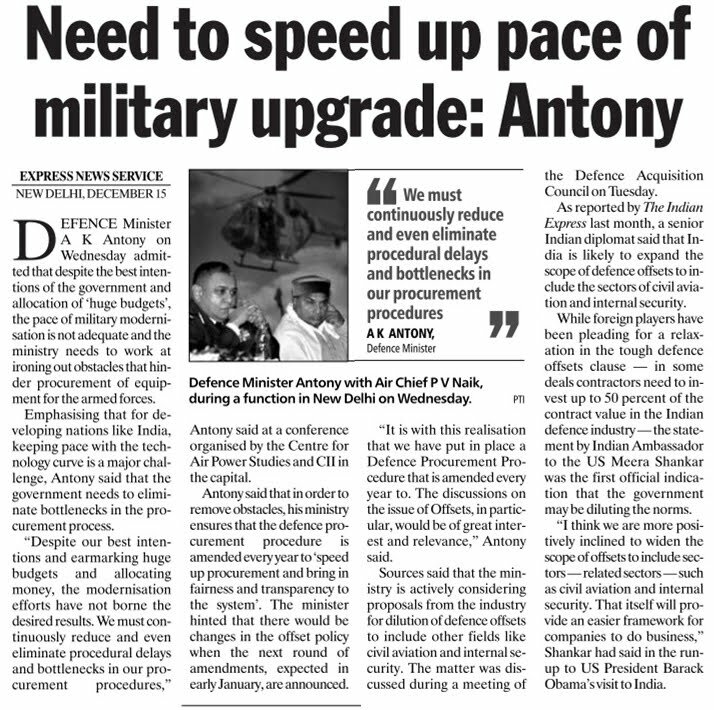 Only armed forces are taking strong action," Antony told reporters on the sidelines of an aerospace seminar here. When asked about the alleged involvement of senior serving and retired officers from the armed forces and the defence ministry in getting prime army land in 31-storey Adarsh Society in upmarket Colaba transferred to the private housing society, Antony said: "There are two inquiries by CBI and the Army to fix responsibility. These investigations are going on. We will take whatever action is required. There will be no let up." "We want to maintain integrity. We will not ignore it," he added. Defence Minister A K Antony had earlier last month recommended a Central Bureau of Investigation (CBI) probe to fix responsibility of the armed forces and defence estates officers in the Adarsh Housing Society scam in Mumbai. He also asked the CBI to look into the circumstances under which a No Objection Certificate was issued to the Adarsh Housing Society to construct the 31-storey building on a piece of land, which was in the ''de facto'' possession of the Army. The Indian Army''s Southern Command, which is headquartered in Pune, had on Saturday (December 11) ordered a probe to find out which army officers had issued a no-objection certificate to the Adarsh Society to construct a 31-storeyed complex on a plot in Colaba in Mumbai. The 31-storey Adarsh Society, originally meant for Kargil war heroes, landed in controversy after media reports said several politicians, bureaucrats and defence personnel owned flats there. The CBI had on November 15 registered a Preliminary Enquiry (PE) to probe the alleged role of former and serving Army officers, with the permission of Defence Minister A K Antony. The plush housing Society, built on prime defence land, has been constructed in alleged violation of rules. It was originally meant to be a six-storey structure to house Kargil war heroes and their kin, but was later extended to 31 floors without mandatory permission. The exposure of the scam forced the Congress party to seek the resignation of then Maharashtra Chief Minister Ashok Chavan. Some nations misconstrue India's military modernisation: Antony Defence minister AK Antony on Wednesday said India's armed forces modernisation was "often misconstrued" by some nations and asserted that the country had a proven track record of harnessing military technology for "peaceful and non-violent" purposes. "Our efforts at strengthening our Armed Forces are often misconstrued by some nations. India has a proven track record of harnessing technology for peaceful and non-violent purposes and ones essentially aimed to strengthen our defence capabilities," he said without naming Pakistan or China as countries that may have those apprehensions. "Translated in the context of aerospace industry, it would mean enhancing military and dual-use technology that would benefit our armed forces and also have spin-off benefits for the civil populace," he said delivering a lecture at an international aerospace seminar in New Delhi. He said armed forces modernisation remained on the top of the government's priority list. "However, despite our best intentions and earmarking huge budgets and allocating money, the modernisation efforts have not borne the desired results," he said. Several procurement plans of the armed forces have been lagging behind, which included the Army's artillery modernisation, Navy's augmenting of its fast-depleting submarine fleet and the IAF's air defence capabilities and MiG-series fighter aircraft that have reached the obsolescence stage. However, the armed forces are in the process of procuring artillery guns, medium multi-role fighter aircraft and new submarines for the forces and it is estimated that the procurement plans over the next 10 years is worth USD 100 billion. 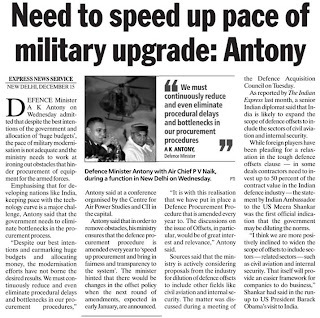 Antony said the Defence Ministry should "continuously reduce and even eliminate procedural delays and bottlenecks" in its procurement procedures. "It is with this realisation that we have put in place a Defence Procurement Procedure that is amended every year to speed up procurement and bring in fairness and transparency to the system," he said. Indian Army awaiting CBI inputs on Adarsh probe The Indian Army said on Wednesday it was waiting for inputs from the Central Bureau of Investigation (CBI) to complete its probe into Mumbai's Adarsh housing society scam in which some retired and serving officers are under the scanner for allegedly cornering flats meant for families of war heroes. "The inquiry (into the Adarsh housing scam) is under way. The CBI will go in detail to probe the matter. An internal inquiry (by the army) is also on. The CBI will give its details and we will take action against those found guilty," army chief General V.K. Singh told reporters on the sidelines of a function for giving aid to war widows and disabled soldiers. Singh was replying to questions on the 31-storey building that has come up within the security perimeter of an Indian Navy establishment in the upscale Colaba area of south Mumbai. The scam was unearthed after the navy raised an alarm about the skyscraper that was posing a grave security risk to vital installations. A probe by the defence ministry has revealed that some army and defence estates officers had colluded with the private housing society to construct the building, ostensibly meant for war widows and war veterans, and got themselves plush flats at throwaway prices. Two simultaneous probes being conducted into the scam. The accused serving defence officers will face an army instituted court of inquiry under the Amy Act while the retired officers are under the CBI scanner because they are not governed by the act. Major General R.K. Hooda, who was the general officer commanding (Maharashtra and Goa area) during former army chief General Deepak Kapoor's tenure before being posted to Delhi five months ago, is also being probed. His name figures in the list of the over 100 allottees in the skyscraper. The scam surfaced after the Indian Navy raised an alarm that the highrise, built on 6,450 sq meters within the Colaba naval area, was posing a security threat to military installations. The navy, it is said, is exploring the option of demolishing the building. 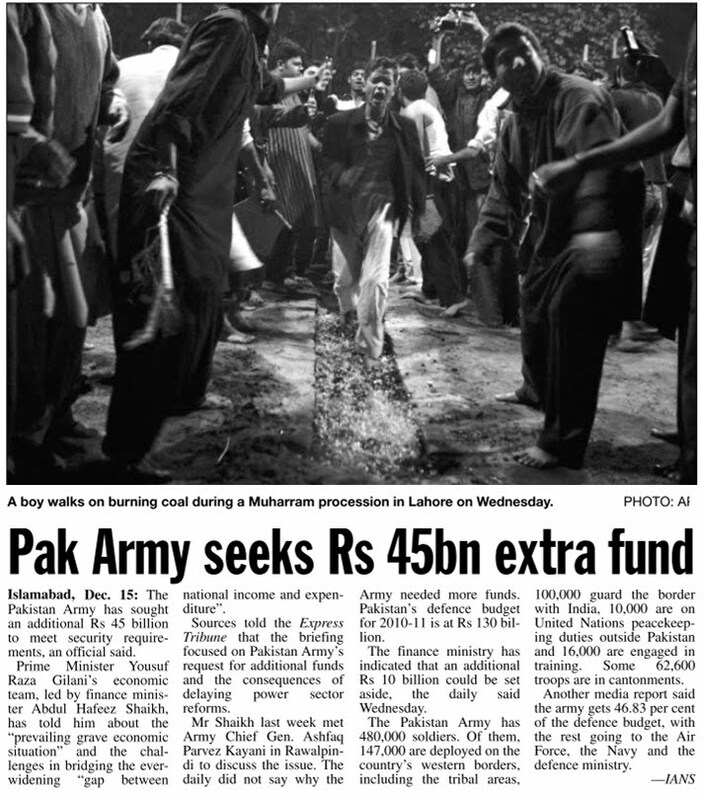 Asked about this, the army chief said: "I don't know about it." ISI 'mole' had phone nos of defence units Mateen Hafeez, TNN, Dec 15, 2010, 05.36am IST MUMBAI: The city crime branch and intelligence bureau (IB), who are jointly interrogating alleged ISI mole Javed Mozawala, have recovered more than 87 coded telephone numbers belonging to defence establishments across the country. According to security sources, most numbers belong to naval establishments. "The numbers were typed on a piece of paper. We are still questioning Mozawala as to whether he received these numbers from someone or prepared a list of these coded telephone numbers for any of his contacts," said a source. The numbers belong to electronic private automative branching exchange (EPABX). "These are confidential numbers. How did Mozawala get hold of these and for what purpose? This question must be answered," said a source. One of the latest trends in EPABX development is the VoIP PBX, also known as IP-PBX or IPBX, which uses Internet Protocol to carry calls. Most modern PBXs support VoIP. 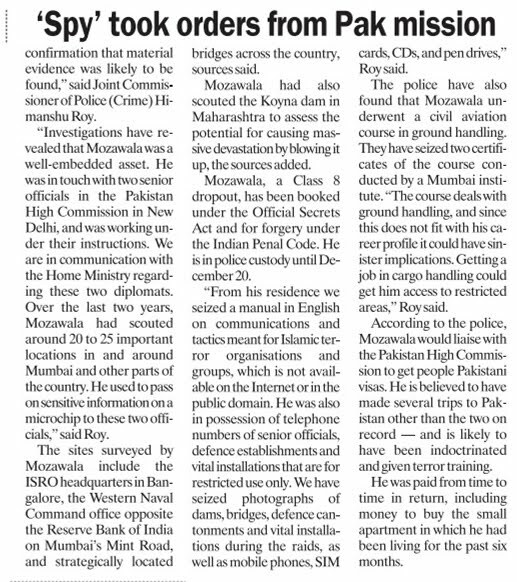 Mozawala (28), a resident of Infinity Towers at Mazgaon, was arrested last Thursday on charges of spying for a foreign country. On Sunday, he was produced before a court and remanded to police custody till December 20. 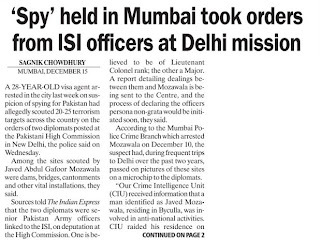 Crime Branch sources said he was allegedly in touch with a foreign contact at the Pakistan embassy in New Delhi. 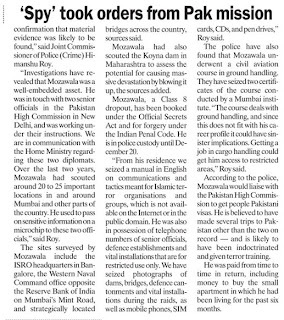 Mozawala is suspected to be a spy for Pakistan's ISI, and that he did a recce of the Indian Army's cantonment area in New Delhi in mid-2010 and of an important location in Mumbai. He has been booked for forgery and spying. "We have also recovered two blank certificates of 'Inflight Management Training' from him. This is why he has been charged with forgery. The certificates are fake," the source said. Mozawala is in police custody till December 20. "It's too early to say whom Mozwala was in touch with at the Pakistani Embassy in New Delhi. The 15 passports recovered from his house belong to various people, including job seekers who wanted to go abroad. Mozawala owns a private tour and travel agency, and he might have got these passports for visa stamping," the source said. The police found that Mozawala had an account in a nationalised bank with a total deposit of only Rs 780. 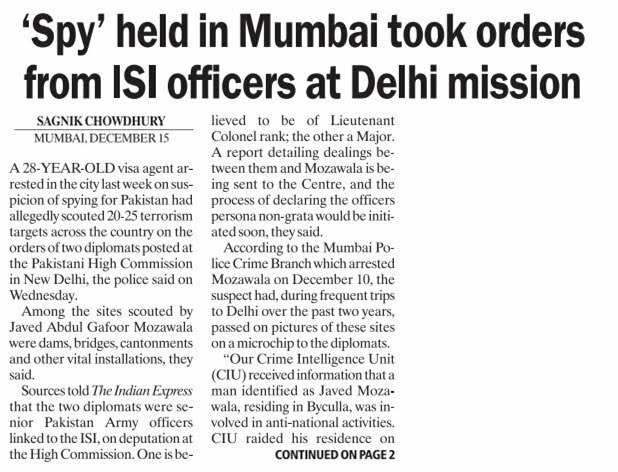 "A team of IB officers from Delhi has come to Mumbai since the recce was done in Delhi too," the source said. The police have seized a computer, a hard disk, five DVDs, two pen drives, a mobile phone, sim cards, maps, pictures and documents from Mozawala. He had drawn maps related to the job assigned to him, a police source said. Cyber security command on cards in India HERALD CORRESPONDENT Cyber security command on cards in India HERALD CORRESPONDENT NEW DELHI, DEC 14 The National Security Advisory Board (NSAB) has recommended formation of a central cyber security command on the lines of the US Cyber Command (USCYBERCOM) set up last May to fight back the new generation attacks on the government’s computer systems and networks. A policy paper of the board stresses need for such a command not only to prevent any leaks of the sensitive information but also to ensure the valued government data is not hacked or destroyed by anybody from outside or from within the system. The document gives an insight to a lot of work done by China for inflicting damage to the computer networks in other countries. The latest such attack was made on the website of Central Bureau of Investigation (CBI), purportedly from Pakistan, destroying all the data on its website (cbi.nic.in) which is still not up even after 11 days of struggle by the National Informatic Centre engineers who maintain the government websites. Luckily, the intruders could not get into the CBI’s computer that stores the sensitive data, inaccessible easily from the Internet. India does not have the risk of wiki type leaks as access to the classified and sensitive material is limited to a very limited number of top officials unlike even a corporal having access to the diplomatic cables of the US missions, the government sources say. Moreover, they say the government organisations doing the sensitive works have been already ordered to prepare cyber crisis management plans. Defence and nuclear installations had upgraded their measures and laid down standard operating procedures even before wiki-leaks started trickling early last July, when Iranian nuclear facilities in Natanz were reportedly hit by a computer worm Stunxnet. This work is touted as the first discovered worm that spies on and reprogrammes industrial systems. Russians described it as a working and fearsome prototype of a cyber-weapon that will lead to the creation of a new arms race in the world. Only the other day Defence Minister A K Antony admitted in Parliament that India is already exposed to the possible cyber attacks and explained how the top army brass was working in unison to make cyber systems secure and non-porous to protect systems. 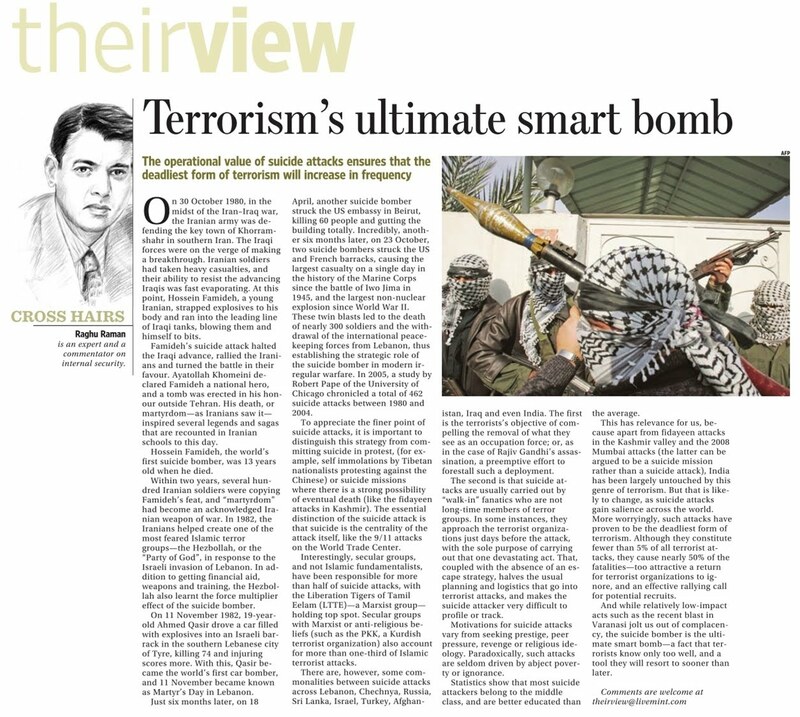 “The paradigms of security in the age of information technology are seldom constant. The evolving security matrix is complex and calls for co-operation and coordination of the highest level,” Antony said. Earlier last month, he also told the army commanders that cyber attacks were “fast becoming the next generation of threats” and as such, no single service could work in isolation. “We need to make our cyber systems as secure and as non-porous as possible,” he said. 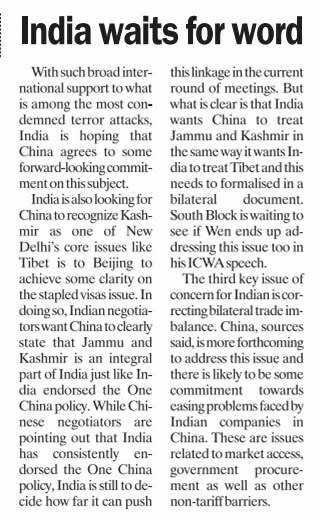 The assertion comes amid frequent attacks and the subsequent alerts sounded by the army authorities over China and Pakistan-based cyber spies peeking into India’s sensitive business, diplomatic and strategic records. The policy paper distributed by NSAB among the country’s strategic community stresses on simultaneous creation of a security centre that should monitor cyber operations and undertake active monitoring of cyber space. It also stresses need for funding to develop innovative technologies to protect the Indian networks and promote growth of critical skills in the arena. The research paper, titled “Informationising Warfare” warns that “as China grows militarily and economically, its resultant strategies are all likely to expand, especially in the cyber warfare arena.” Perhaps the most crucial among the beyond rules criteria is manifested in the form of “asymmetric warfare” — for instance, cyber attacks directed against data networks. 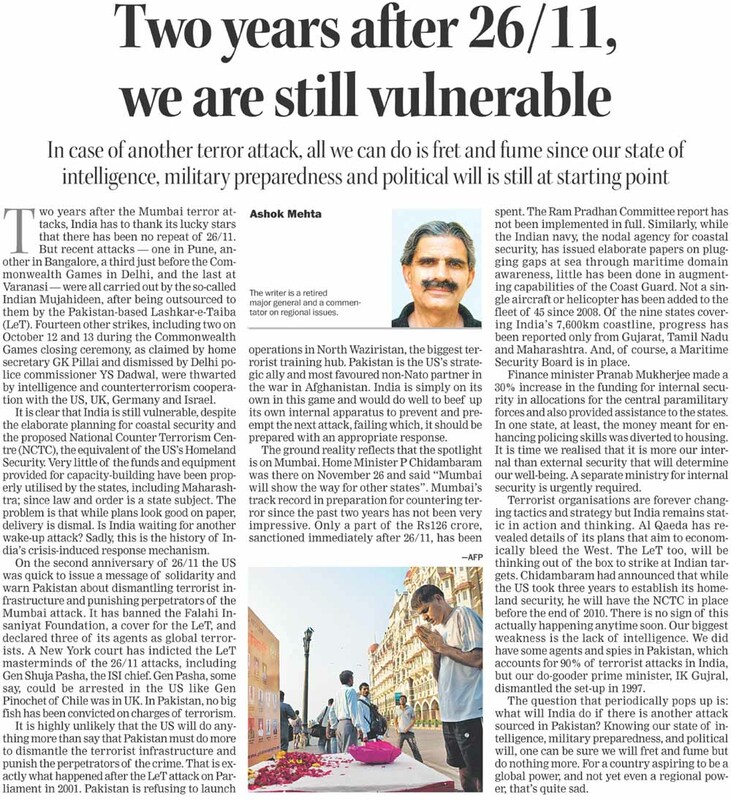 “The primary idea is to strike in unexpected ways against vulnerable targets,” the paper says, stressing that India has to prepare for these strategies that do not fall in the terrain of the present defence structure of Indian Army, Indian Air Force and Indian Navy, the researcher underlined. The research paper quotes two Chinese strategists explaining a “combination scenario” being tried by China in which it secretly musters large amounts of capital and launches a sneak attack on an adversary’s financial markets. Subsequently, it inflicts a computer virus and hacker attachment in the opponent’s computer systems and attacks his networks to disrupt and paralyse the networks of civilian electricity, traffic dispatch, financial transactions, telephone communications, and mass media, thereby causing social panic, street riots, and political crises for the adversary, the paper said. The cyber warfare consists of two types: Cyber attacks and cyber protection. Cyber attacks include virus attacks and hacker attacks. Computer virus attacks refer to operational actions that use computer viruses to destroy or tamper information stored in computer systems in a manner that they do not work properly. “In the military field, the core equipment of military information systems and cyberised weapons are all likely targets of computer virus attacks. Computer hacker attacks refer to those actions taken by hackers to intrude upon and destroy an opponent’s cyber systems,” the paper stressed. It points out that Beijing is also pursuing a diverse and comprehensive portfolio of space warfare investments since the late 1980s. The status of these programmes runs from advanced concept development and testing, through product engineering evaluation, line-level manufacturing and acquisition from foreign sources, to integration as war-fighting capabilities into the Chinese armed forces. “The evidence suggests that these programmes are protean: They lend themselves to steady evolution across the spectrum, from space denial to space dominance, if Beijing’s political goals change over time, though at present and for the foreseeable future, they are optimised for the space-denial mission,” the paper said. Its stress is that the defence planning and implementation in future has to incorporate the virtual word to limit physical damage to the real one as China is increasingly integrating computer technology into modern military organisations to play the twin roles of being both a target and a weapon. Cyber forces are most likely to be integrated by China into an overall battle strategy as part of a combined arms campaign. The aim is to increase the ‘fog of war’ for the enemy and to reduce it for one’s own forces—to be achieved through direct military strikes designed to degrade the enemy’s information-processing and communications systems or by attacking the systems internally to achieve, not denial of service, but a denial of capability.